Soybean has certainly become a favourite among producers. The growing trend in soybean production is not only seen on the local landscape but across the globe. Prior to the drought in 2016/2017, South Africa produced its highest soybean production of just over 1 million tons. By then, production had already been on an upward trend but got interrupted by the severe drought, resulting in a 30% decline in overall production in the 2016/2017 marketing year. In the current marketing year (2017/2018), soybean production is estimated at a record 1,3 million tons, with the area planted higher by 13,4% from the previous season, and by the looks of things it seems production is likely to continue on an upward trend. In the latest intentions to plant, released by the Crop Estimates Committee, the area planted to soybean is expected to increase by 25%, from 573 950 ha in 2016 to 720 000 ha in 2017. A large part of that shift is mainly farmers moving away from planting maize to substituting it with soybeans. The attractiveness of soybean production has recently been supported by a growing local demand and profitability of the crop as compared with that of maize. In recent years, consumers have shown a strong demand for food high in protein. Such an increase in demand spills over to the livestock industry which has subsequently driven rapid demand for feed such as oilcake. In the current marketing season, the soybean crushed to produce oil and oilcake accounted for 86% of total domestic soybean demand and has risen over the years. Graph 1, indicates local crushing margin from 1999 to 2017/2018 marketing season. 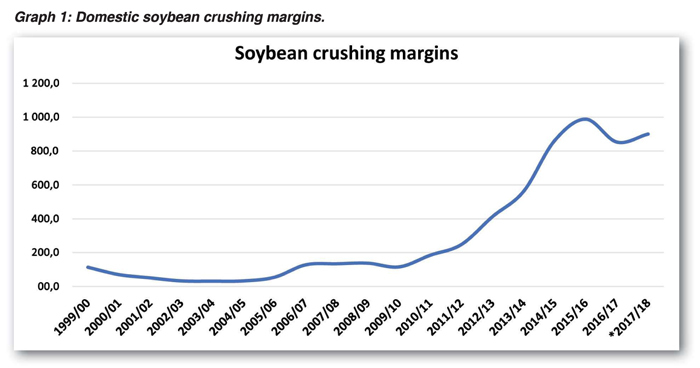 There has been a rapid increase in soybean crushing margins from 2009/2010 marketing year to date, however this steady rise was also accompanied by a few dips in the crushing margins and that can be attributed to years when South Africa had shortages, such as the 2016/2017 marketing year. However, in 2017/2018, crushing margin is once again picking up and is estimated to reach 900 000 tons. This healthy rise in demand can be largely attributed to the attractiveness of the industry, however it is important to note that although soybean production is on a rise in South Africa, some farmers have experienced the crop to be much more difficult to grow than other crops and its perceived to be less resilient than maize particularly in the drier areas such as the Free State, so just as any other crop, it too has a risk factor.